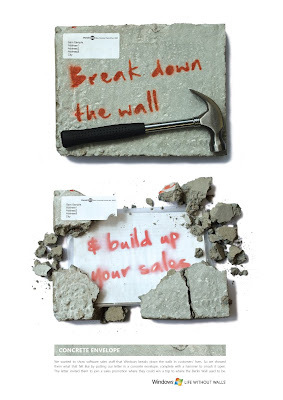 They wanted to show software sales staff that Windows breaks down the walls in customers’ lives. So they showed them what that felt like by putting the letter in a concrete envelope, complete with a hammer to smash it open. Agency: Y&R Auckland, New Zealand. The Sydney Morning Herald "Cymbals"
Minigolf World Championships 2009 "Drainpipe"
John Caples Awards entries now open. Basheer Graphic Book "Rainbow by Pantone"
WorkSafeBC "Raise Your Hand three"
Republic of Singapore Navy "Uniform"
Burger King "The Angry Whopper Angrrrometer"
Sourcy Vitamin Water " Amphibian Invasion"
Mundo do Condomínio "Sponge card"
Ryan Oughtred "Healthy Christmas Gift"
Israel Cancer Association "Unknown stain"
National Association for the blind "Donate eyes"
BC Adventure Survival Training "Business Card"
Dog Hotel Doggyday Inn "Abandoned posters"
Tok & Stok furniture store "Sale"
Maximum Ride "Kids who can fly"
AGRIE Paint Services "Business Card"
PacBlue Printing "Oversize business cards"
Green Korea United "Buy 1 Get 1 Free"
TV3 - Hitched "Stag Do"